Relationships can make the impossible possible. From our recent resource development work, we are keenly aware of how important making connections can be garnering support, picking up momentum, and getting our goals achieved. Because of the critical financial support we receive from you, our supporters, we have been able to continue to be the warm and reassuring voice on the phone responding to a pregnant woman who has just learned she is expecting a baby who, in all likelihood, will have Down syndrome. We want to be able to continue to support the teacher who in the midst of the chaos of elementary school takes the hand of a child to lead them into the circle of friendship and ultimately into life of interconnectedness and community. 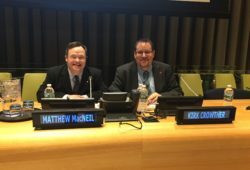 It is our relationships with citizens with Down syndrome, with our stakeholder and advisory groups, and ultimately with you, our membership that inspires us to continually challenge what we thought was “the best we can do”, the “most we can raise”, and the “farthest that we can reach”. We need your support now more than ever-we are facing the very real possibility of being unable to continue with our current level of support to individuals, families, local groups, and affiliates. Help us ensure we are here for individuals and families in the coming months and years. We welcome your own ideas and projects for fundraising in your community. Celebrate your wedding or the holiday season by including the Canadian Down Syndrome Society in your festivities. In Lieu of Wedding Favours: Show your appreciation of guests and loved ones by making a donation to the Canadian Down Syndrome Society. CDSS can create personalized place cards for each guest or a single card for the centre of each table or guestbook, to let your guests know of the gift you have made in their honour. 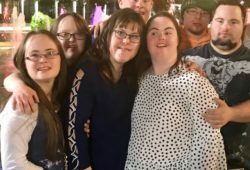 In Lieu of Wedding Gifts: For couples that are looking to contribute in other ways, ask your guests to make a donation to the Canadian Down Syndrome Society instead of purchasing wedding gifts. CDSS can create small cards to include in your wedding invitations acknowledging your generous request. Guests can conveniently make their donations online, by phone or by mail. Give The Ability: Want a great way to get into the holiday spirit AND advocate for people with Down syndrome? With Give the Ability, we’ll give you the tools you need to have a quick and easy fundraiser for CDSS. It’s perfect for an end of the year office party or office fundraiser initiative. Join us this holiday season and show your support for inclusive education, employment, and equal opportunities in Canada. More information will be posted during the winter holiday season. To coordinate a celebration gift or fundraiser, please contact us.